Titanic poster sold Belfast Telegraph – 365posterblog. A rare poster advertising transatlantic trips on the ill-fated Titanic and her sister ship, the Olympic, has sold for £7,400 at auction. The advert, featuring the words ‘White Star Line, RMS Olympic & Titanic, largest steamers in the world’, was produced in or around 1911. Before the Rare & Important Travel Posters sale at Swann Auction Galleries in New York, the Titanic-Olympic poster had been set to fetch between $8,000 and $12,000 (£6,000 to £9,000). In the end, it was snapped up for $9,750 (£7,400) by an online bidder. 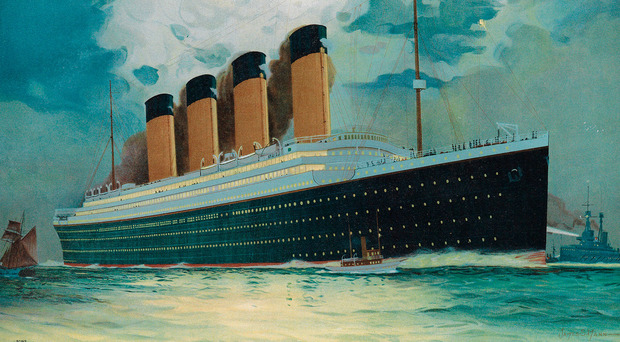 Although the poster features an image of the Titanic’s sister ship, the Olympic, it is the references to the Titanic which make the poster so desirable and valuable for collectors. Both ships were built by Harland & Wolff in Belfast. When Swann Auction Galleries sold a similar Titanic poster in November 2015, it fetched £8,000. The Titanic-Olympic poster is by artist James Scrimgeour Mann, who was born in Dundee in 1883. Mr Mann inherited his enthusiasm for the sea from his father, James Mann Snr, who was captain of a Dundee ship and who died at sea off the coast of South Africa in 1901. 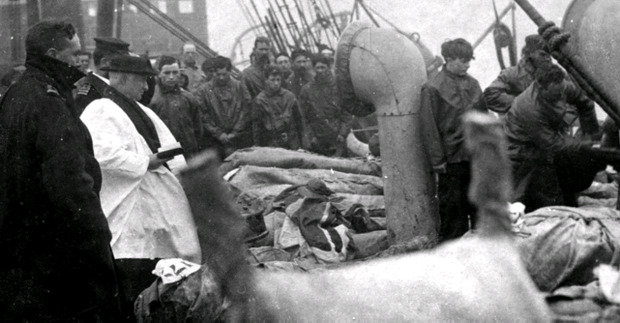 The photograph shows bodies in sacks piled three high on the deck of the CS Mackay Bennett, before being tipped overboard as the ship’s priest conducts a service. Photo issued by Henry Aldridge and Son. Also sold on Thursday night at the Swann Auction Galleries was a 1926 poster advertising Northern Ireland as a tourist destination. Commissioned by the Ulster Transport Authority and emblazoned with the words: ‘Salmon Fisheries, Northern Ireland’, it sold for $1,250 (£950).